It was our last pet and housesit in Europe on what had been a marathon tour. Our energy was flagging after nine months on the road. The drive from France to Italy was amazing with stops at the beautiful Annecy, followed by an overnight and day in stylish Turin. It was capped off by several days in fascinating Florence. Gai and I agreed we could have easily lived there! We had a final leg to Central Italy. 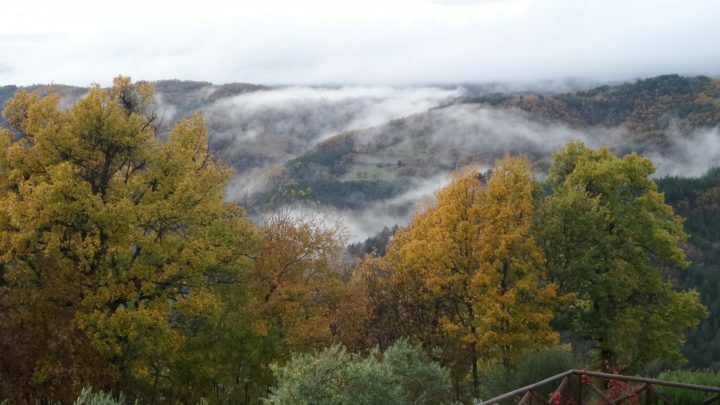 The Umbrian Mountains was our destination for six weeks of living like locals. The assignment had come via our friends in Normandy, the Colonel and Lorraine. Their British friends, who lived in Italy, were going back to the home country for a month and a half of ‘family’ time, especially with the grandchildren. 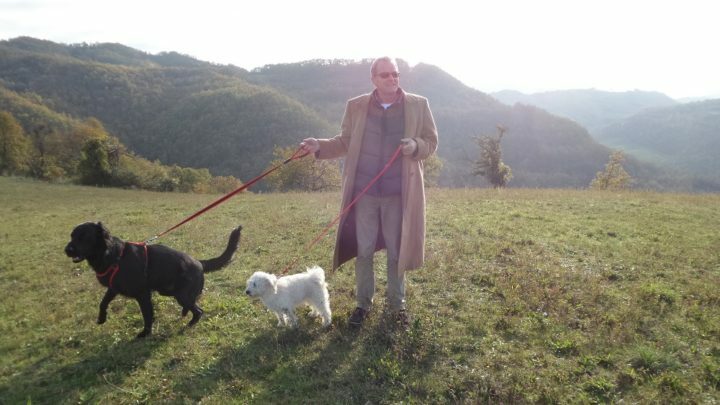 They needed to leave their beautiful animals (two dogs and two cats) and their equally beautiful Italian paradise behind. We had spoken on the phone several times and got to know each other a little. This former professional couple were easy to deal with. There was one reservation about how isolated their property was, and would we be okay with that? When we finally drive up the mountain after going through the city Umbertide (Italians pronounce this as umˈbɛrtide) we started to look at each other, questioning our decision. Another 30 minutes on and deeper into mountain territory, the looks between us became more intense. What have we put ourselves in for? Travelling the last dirt road along the ridgeline of the mountains, we finally arrived. The property was spectacular and perched right on the tip on the highest peak. Sweeping vistas as far as the eye could see, with peak after peak and a overlooking a huge valley. Wow. We drove through one of two sets of imposing electric gates and parked at the top ‘carpark’ before making our way in. The fully-secure fenced allotment of several acres was breathtaking. Our hosts met us enthusiastically, as did the two dogs. A huge Flat-coated Retriever with the elegant name of Montalbano was an odd partner for a plucky little crossbreed white fluffy dog. 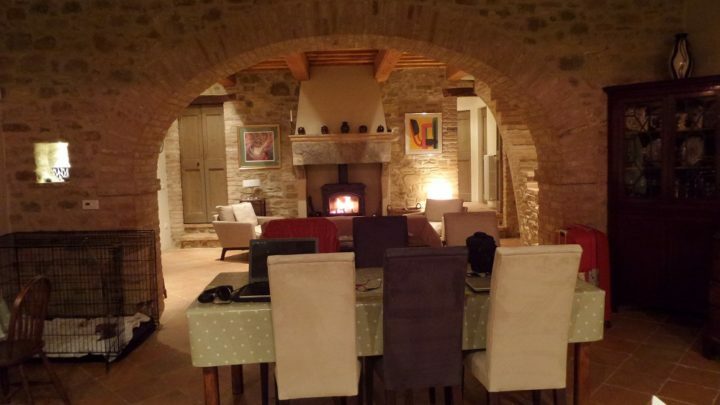 The retired British couple took great delight in showing us around their lovely property named La Fontanella. It took a while to see everything and learn all that was required to run their estate while they were away. Inside, the house was well stocked with just about everything. We later found out it was a two-hour round trip to the nearest supermarket at Umbertide. The architecturally designed home was constructed around the bones of a former stone cottage. The owners had retained the ‘feel’ of the ancient cottage with the use of internal brick and stone. Big timber floor-to-ceiling window shutters were secured over the top by heavy steel grills. Thanks to its position on the block, the home captured maximum views across the mountains, and the landscaping was truly outstanding. Long sweeping walkways had been constructed to take advantage of the slope. A huge pool complex sat high on the block with a deck overlooking the mountain ranges. The expansive interior of the lower section was a combination of huge kitchen, dining room and fireside loungeroom. With all the shutters opened, the sunlight streamed into keep the place warm as winter approached. As we said goodbye to our hosts, the two cats appeared and were harassed suitably by the dogs. They were all friends at night as the six of us snuggled onto the comfy upstairs sofas to watch television and be warm by the fire. We slowly became accustomed to this style of living and our daily walks inside the property soon spilled outside the gates. The dogs, Monty and Livvy, enjoyed their sojourns into the open spaces, however at times came back covered in burrs and prickly things that stuck to their coats. It took ages to pick them out by hand. The dogs were lovely to care for. Monty was playful and wanted hugs all the time. He would put his large paws on our shoulders and lick our faces until we couldn’t take any more. Livvy would lick us almost constantly. They were inseparable. As we’d been advised, a trip to the shops was a major event. It was a couple of kilometres travel down a single lane road, onto another dirt road with bone jarring ruts all the way, then onto the bitumen road down the mountain, then a sweeping right-hander for the 30-minute portion into town. Phew! A good hour there and another to return. Don’t forget the milk! The next six weeks were something very special for us. With the introductions from the owners, we managed to embed ourselves deeply into the local scene. This was perhaps the finest we’ve had living like locals. Have you travelled to Italy? How long was your visit? Would you have liked to have stayed longer?